The medicinal cannabis industry, whilst attracting a lot of publicity, is still in its early stages as a new niche with very few current or even experienced market participants. Even the big pharma companies have so far been apprehensive towards taking significant stakes in medicinal cannabis, and have preferred to wait out the legislative rigmarole making headlines in the US, Europe and Australia. However one early moving company is bucking the trend to advance its range of cannabis‐derived, therapeutic nutraceutical products right now. Creso Pharma (ASX:CPH) has just listed on the ASX, and has hit the ground running with a number of deals struck including one that is likely to see immediate revenues. However, it is still an early stage company and if considering this stock for your portfolio apply caution to your investment decision and seek professional financial advice. For those unaware, “nutraceuticals” is a broad category of products, and depending on a product’s ingredients and manufacturing, it can be regulated in different ways – as a traditional drug, as a dietary supplement, as what is called a “foodstuff”, or even as medicinal food. These various regulatory pathways are quite different from each other. For investors, it is important to know that if you are selling a product through the nutraceuticals pathway, you can manage the regulatory pathway so as to side step lengthy and expensive clinical trials required for traditional medications to get regulatory approval, and go straight into selling the products much faster. 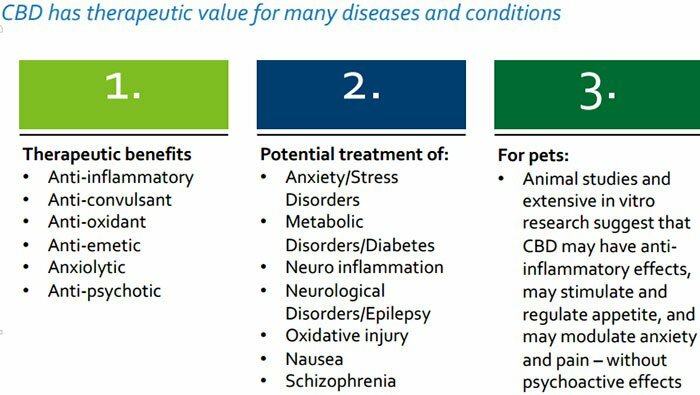 CPH is entirely focused on helping patients and consumers with a range of innovative nutraceutical products that target the “endocannabinoid system”, a unique control regulatory system in all vertebrates which is involved in the regulation of numerous physiological processes that affect many important functions, including how people and animals feel pain, experience emotions, move and react. What better way, then, to maintain a natural functional system than through the use of nutraceuticals. As legislation has noticeably softened across the developed world, a huge market opportunity has presented itself, with CPH attempting to place itself at the forefront with its nutraceutical, endocannabinoid-aiding products. CPH wants to be one of the first companies to sell medicinal cannabis products not only to people, but also for animals. If you thought medicinal cannabis could only be of help to humans, there is also growing evidence to suggest it can assist in a large variety of ailments that affect animals – we are talking about things like anxiety, inflammation, arthritis and diabetes. If CPH is successful in its mission of bringing its animal-focused products to market it will be able to build a large addressable market that’s as commercially friendly as the human market. Thus far CPH is taking giant strides to achieve its rapid commercialisation aims, by partnering with major corporates to assist. CPH has just signed a Letter of Intent (LOI) with Grevelings Netherlands , a veterinary product manufacturer and wholesaler, and Swiss animal health company, A&H Health Switzerland to develop and commercialise CPH’s innovative cannabidiol (CBD)-rich hemp-derived nutraceutical products for the global pet market. When you consider some pet owners spend more money on their dog than they do themselves, most pet owners are likely to be intrigued at the thought of non-psychoactive medicinal cannabis being able to treat various chronic ailments in their pets without serious side effects. On the human side, CPH has signed a further LOI with Swiss Pharmaceutical firm Streuli Pharma AG for the commercialisation of its first human nutraceutical product in the Swiss market, and has signed its first distribution agreement with MEDI-IN s.r.o for the company’s self-produced food supplement hemp product , CBDium from Hemp Industries – which will be sold initially in the Czech Republic and bring in immediate revenue and cash flow . With that in mind CPH is aiming high in the ‘nutraceuticals therapeutic’ market and intends to deliver health benefits to humans and pets in a range of different ways. 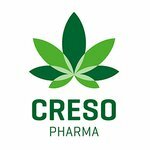 Creso Pharma (ASX:CPH) listed on the ASX on October 20 th 2016, raising over A$5 million, and is already pushing hard for its maiden revenues from its nutraceutical therapeutics market niche. If you haven’t yet seen FNN’s interview with CPH’s Management from earlier this year, it summarises CPH’s market strategy in great detail. The core idea underpinning CPH’s therapeutic product range is optimising and restoring normal endocannabinoid function and re-establishing internal balance which in turn helps to manage various ailments for example inflammation, anxiety, and pain. CPH’s cannabis and hemp derived therapeutic products are therefore a supplement and not a substitute. The products will supplement deficient and unbalanced naturally occurring endocannabinoids with the phyto-cannabinoids from the cannabis and hemp plant, to help the body restore homeostasis and synergise naturally with its endocannabinoid system, creating better overall health. Think Vitamin C tablets rather than antibiotics, and fish oil rather than cough mixture. For an in-depth look into CPH’s newly-listed commercial aspirations, read our previous article Newly Listed Medical Cannabis Stock Targets $200BN Nutraceutical Opportunity . Did you catch our most recent Next Biotech article on Noxopharm (ASX:NOX)? Since we last covered CPH there has been a flurry of activity — all of it commercially-aspirational to the extent that despite being an early stage start-up, CPH is realistically targeting its first revenues by the end of 2016. CPH has moved quickly to put its distribution strategy into effect, signing an agreement with MEDI‐IN s.r.o. to market Hemp Industries’ bottled hemp extracts at over 350 retail stores across Europe, starting with the Czech Republic. Slovakia-based Hemp Industries was previously acquired by CPH, and the acquisition enables it to generate early revenues and also allows the company to help with sourcing the key ingredients of its therapeutic products. 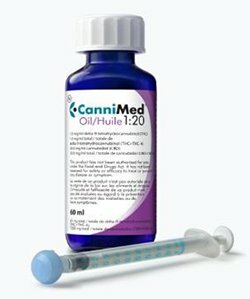 MEDI-IN is a leading distributor in Slovakia and the Czech Republic with connections to hospitals and pharmacies, so this commercial agreement is also likely to enable Hemp Industries/CPH to gain significant exposure for its CBD-based extract products to communities disenchanted with big pharma and expensive prescription medicines. MEDI-IN has committed to undertaking a comprehensive marketing campaign to market CPH’s CBDium product, which could make this the deal that lights the touch paper on sales for CPH. One other recent agreement that could have significant impact is the binding LOI with veterinary product manufacturer and wholesaler, Grevelings Netherlands, a global manufacturer and wholesaler of veterinary products and Swiss animal health company A&H Health Switzerland. This LOI will enable these companies to develop and commercialise CPH’s Veterinary nutraceutical products for the global pet market. 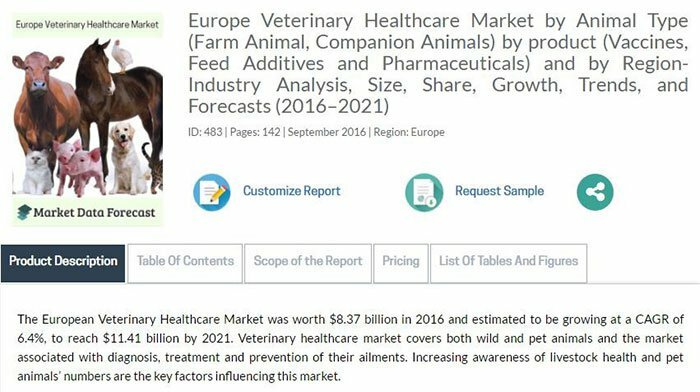 Veterinary healthcare was estimated to be worth $US25BN in 2015 with a CAGR of 8.06% from 2016 to 2021 . In 2021, it is estimated to be worth $US39.7BN. Europe accounted for $US8.37 billion in 2016 and is forecast to grow to $US11.41 billion by 2021 . CPH is looking to capture a leading share of the global pet care market as well as a leading market share of the hemp-derived animal health market. Yet, how much of this market CPH is able to capture remains to be seen, so do your own research and take into account all available information with regard to this stock before making an investment decision. Europe will be its main focus for now, but it will also soon target the Middle East, the Gulf Region and Latin America. Under the LOI, the three companies will develop and commercialise a range of CPH’s innovative CBD-rich hemp-derived products to be administered via specialised veterinary delivery systems. Greveling Holding BV will act as the key partner for the deal, both in developing the products and as commercialisation partner in Europe, the Gulf Region and the Middle East. A&H Health Switzerland is certified by the Swiss licensing and regulatory authority, Swiss Medic and will be the distributor for Switzerland. The product development will take place in Europe but sales will be global. CPH will develop its range of CBD-based nutraceutical products from its headquarters in Switzerland, and plans to market its products across Europe, starting initially in Eastern Europe before moving across mainland Europe and further afield. The strong card for CPH is that it is pitching its products into an industry still in its infancy, with a management team that is immensely experienced and has proven long years of pharma expertise in developing and launching new medications globally. In this case, they are working with nutraceuticals offering lighter regulatory pathway, but with the same high methodological rigour and high pharma-grade quality across the development of the products and the entire supply chain. This should give investors confidence that CPH will develop a strong range of medicinal cannabis products that have both proven positive health-effects, are affordable, and are fully certified for sale anywhere in the world. Just days before announcing its Eastern European distribution deal, CPH signed a binding Letter of Intent (LOI) with Streuli Pharma AG to commercialise in Switzerland its first therapeutic product for human health based on the proprietary INNutri Soft GumsTM technology. Founded way back in 1867, Streuli Pharma AG is a well-run company already manufacturing over 150 million tablets and capsules per year. The products based on the proprietary INNutri Soft GumsTM technology will use a patented innovative method to deliver the cannabis- and hemp-based ingredients into the body through buccal absorption (through the rich blood vessels in the mouth) thus increasing the bioavailability and potential therapeutic benefit. This innovative technology has several advantages over existing health supplement products. The SoftGums are easier to ingest than regular gelatin-based products as they are starch-based and not made from animal waste material; they are also around 60% cheaper than gelatin capsules, and they are vegan, halal and kosher as well as gluten and lactose free. These Soft Gums will be ideal for paediatric and geriatric use. The non-invasiveness, high bioavailability, as well as attractive profile of CPH’s proprietary SoftGums makes them suitable for all age groups and could mean other companies move to adopt such technology in future. If this does happen, CPH will be in line for a significant windfall given the technology is entirely in its hands for all possible phytocannabinoids mixes. CPH has taken its first commercial steps by signing the LOI with Streuli Phama AG. The pathway is therefore very clear with CPH beginning to drip-feed its medicinal cannabis products via distribution agreements while working at full tilt to develop the most competitive nutraceutical products possible. CPH’s market edge comes also from its focus on full plant extracts and avoiding the use of synthetic or single molecule phytocannabinoids. Considering that cannabis is a poly-molecule plant it has been shown that extracting or synthetizing individual molecules may not be as beneficial as utilising the various molecules altogether. Research has shown that cannabinoids and other compounds have a greater effect when taken together than when separated into individual compounds. This concept has been dubbed the ‘ Entourage Effect’ and CPH is conducting its development on the basis that all its products must be made with full plant extracts. This fact could end up having interesting therapeutic benefit and increase CPH’s commercial value. The projected timeline for newly-listed CPH includes launching its initial human healthcare therapeutic product as well as its initial animal healthcare product in about 12 months’ time, followed up by second and third product launches in 18 and 24 months for both human and animal markets. CPH’s products are fully patent-protected which ensures CPH will retain all intellectual property rights. 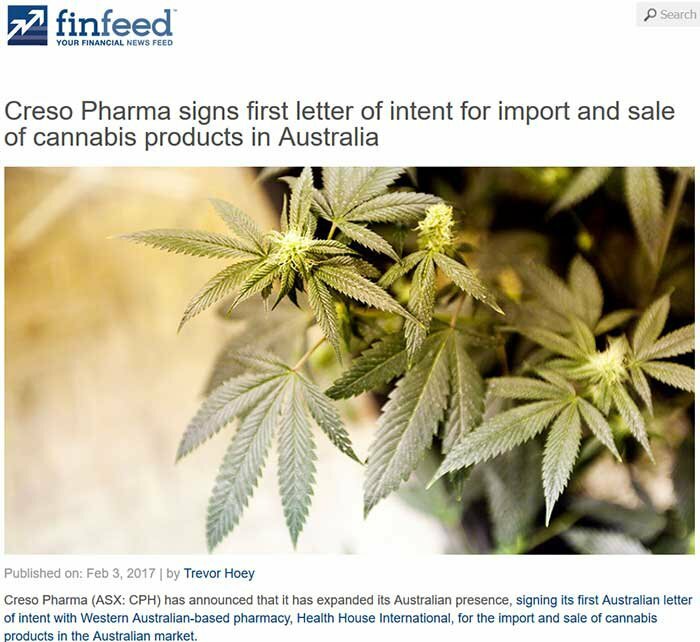 If we then look at the broader medicinal cannabis industry, it quickly becomes clear that having the IP rights snaffled up is a great start when the future market for medicinal cannabis is predicted to reach US$205BN next year . Drilling down into CPH’s home turf in Switzerland — the Swiss nutraceuticals market is on course to reach $400M annually by 2018. ...but is now being unleashed in both medicinal and recreational wrappings globally with the US, Europe and Australia leading the charge for the coming decade. The medicinal cannabis industry is still in its infancy and dominated by small players with little to no pharmaceutical industry expertise, so CPH’s entry could be the formula to commercialise a wave of innovative therapeutic products, as long as the development is done to high methodological rigor and with the highest pharma-grade quality. CPH’s strategy to target both the human and the veterinary markets is another very significant differentiator of the company. There is a remarkable lack of trusted cannabis brands in the global marketplace and established big-pharma giants are still biding their time to decide how best to enter this market, as and when its scope is tied down by regulators. 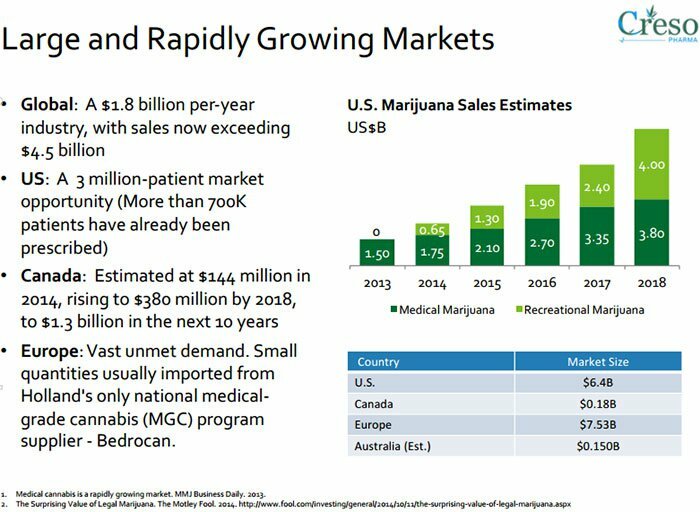 Once they do start to look at medicinal cannabis opportunities, it is likely to be companies like CPH that receive first interest because of, in CPH’s case, its innovative and proprietary technologies, products developed to pharma-grade rigor and quality, with a broad market reach and its early moves into sales. Having taken its first steps towards sales via Eastern Europe and Switzerland, CPH now plans to explore commercial opportunities in the Benelux countries, Italy and Spain, as well as in Canada, Latin America and the Gulf states. All these territories have provided strong indications that medicinal cannabis will continue its path to legalisation while some are already pursuing full-blown legalisation of all cannabis plants including THC-bearing varieties. Significant progress with development and commercialisation preparations has put CPH into a strong position to achieve further key milestones over the remainder of this year. CPH also happens to be well cashed up with a $5 million kitty available to progress its development for the foreseeable future. As government legislation works towards making medicinal cannabis a new commercial industry, opportunistic medicinal cannabis companies such as CPH are already moving to capitalise. How well CPH is able to capitalise on new commercial opportunities is yet to be determined, so investors should seek professional financial advice about CPH before making an investment decision. Purposefully working in territories that have been first to adopt medicinal cannabis, CPH has a strong head start on the thousands of medicinal cannabis companies that will no doubt pop-up once legislation is finalised and ratified. Not content to wait around for this industry to be forged in government committee meetings, CPH is taking the middle way of focusing on the safer nutraceutical side of medicinal cannabis and is already threating to generate its first sales revenues despite listing less than one month ago. 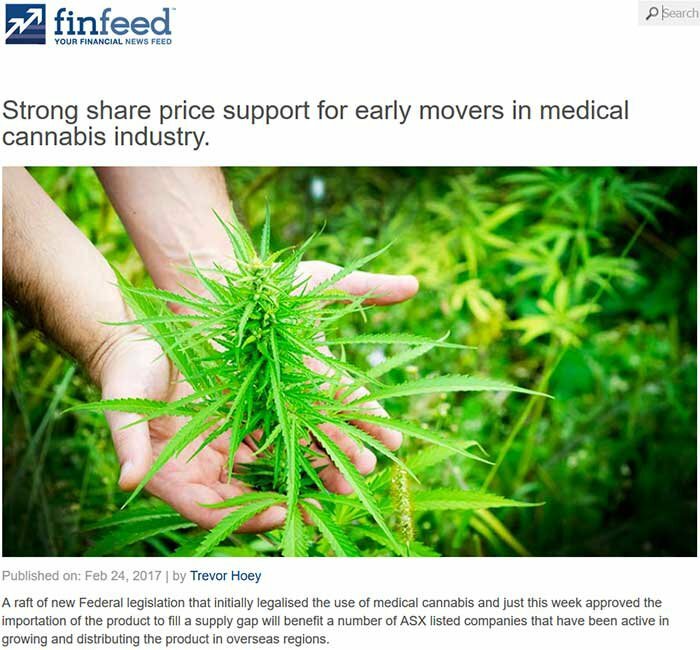 That’s exactly what we like to see from our small-cap steeds here at The Next Biotech — fervent activity soon after listing — and we’re looking forward to more commercially-friendly news flow helping this tight-knit biotech start-up to spearhead a sprawling medicinal cannabis industry.